Anyone who’s traveled through LAS can attest that the taxi queues at McCarran Airport can be outrageously long — in some cases, you can spend an hour or longer waiting for a cab to drive you 10 minutes to your hotel. In fact, getting from the airport to The Strip can be such a frustrating process that Las Vegas took the second spot in our post Top 5 Cities That Need Uber — Now. Uber can now operate out of LAS. Well, our prayers have been answered — as of today, Uber drivers can pick up passengers at McCarran Airport, which will mean shorter waits not only for customers using Uber, but also all those not-yet-in-the-know folks lining up for a yellow cab. Cabs can be hard to come by, but there are plenty of Ubers at LAS! 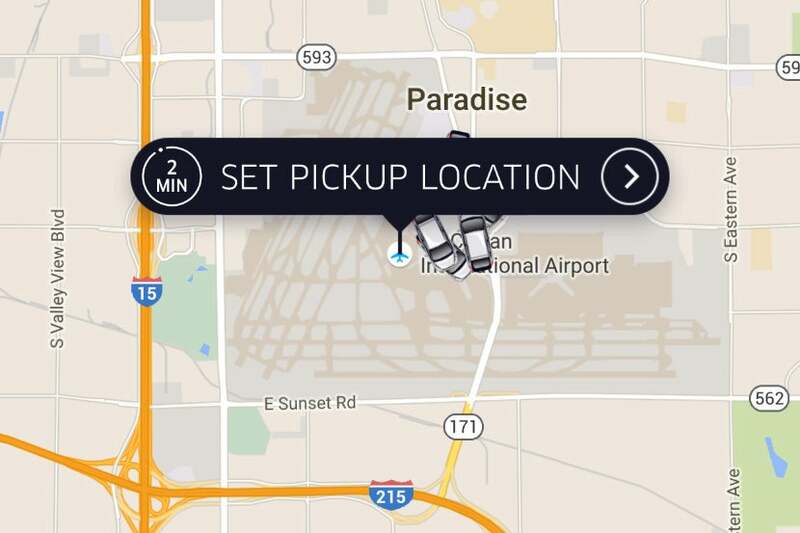 I checked the app, and there are currently plenty of UberX cars in Vegas. Preview fares haven’t been loaded yet, but you can expect to spend less for an UberX than you will for a yellow cab. Also, Uber drivers will be less likely to take the “scenic route” to your hotel, since that could influence the rating you decide to give. Regardless of where you ride Uber, be sure to read our post featuring the 5 Best Credit Cards for Uber and Lyft. You might as well earn lots of bonus points while you’re saving money on your ride. Also, if you haven’t signed up for Uber, you can join here and get your first ride free (up to $15) by using code UberTPG.